The ViewSonic PG603W networkable projector features high resolution, an intuitive, user-friendly design, and a sleek chassis. Exclusive SuperColor technology offers a wide color gamut for beautiful image production in nearly any environment, while SonicMode sound enhancement technology powers a speaker for incredibly clear and audible sound. An energy-saving SuperEco feature reduces power consumption and extends the lamp life. Equipped with LAN controller, this projector makes it easy for IT admin to remotely control and manage multiple projectors from their workstations. With horizontal and vertical keystone correction, 4 corner adjustments, and extensive connectivity, this projector provides for flexible and quick set-ups, and is the ideal projector for use in education and business environments. 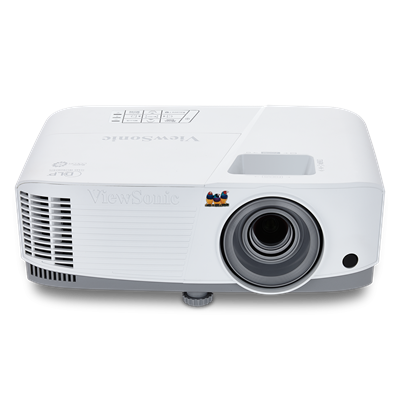 The ViewSonic® PG603W WXGA networkable projector features 3,600 lumens, XGA 1280x800 native resolution, an intuitive, user-friendly design, and a sleek white chassis. Exclusive SuperColor™ technology offers a wide color gamut for beautiful image production in nearly any environment, while SonicMode™ sound enhancement technology powers a 10W speaker for incredibly clear and audible sound. An energy-saving SuperEco® feature reduces power consumption and extends the lamp life by up to 15,000 hours. An integrated USB A reader port, and optional WiFi (PJ-WPD-200 wireless dongle sold separately) deliver flexible content streaming and wireless presentation options. Equipped with Crestron® LAN controller, this projector makes it easy for IT admin to remotely control and manage multiple projectors from their workstations. With horizontal and vertical keystone correction, 4 corner adjustments, and extensive connectivity, this projector provides for flexible and quick set-ups, and is the ideal projector for use in education and business environments. ViewSonic offers one of the industry's best overall projector warranties with 3-year limited parts and labor, 1-year lamp, and first year free Express Exchange service* for an added value worth up to $150**. *One year Express Exchange Service requires product registration.